Saturday he was off finishing his diving course at Bass Lake. I had the morning free and I used it! Lazed in bed for the first time in ages and then eventually, got up, did admin stuff and shopped up a storm at Sandton! In the evening I dragged Varen to oogle baby piggies in Charlotte's Web. Help Is Coming From Above. The classic story of loyalty, trust, and sacrifice comes to life in this live-action adaptation. Fern (Dakota Fanning) is one of only two living beings who sees that Wilbur is a special animal as she raises him, the runt of the litter, into a terrific and radiant pig. As Wilbur moves into a new barn, he begins a second profound friendship with the most unlikely of creatures – a spider named Charlotte – and their bond inspires the animals around them to come together as a family. When the word gets out that Wilbur's days are numbered, it seems that only a miracle will save his life. A determined Charlotte – who sees miracles in the ordinary – spins words into her web in an effort to convince the farmer that Wilbur is “some pig” and worth saving. Sunday he was off diving agai and I somehow ended up shopping, again. I need to stop. But I did get a lovely dress I'd spotted ages ago but didn't buy because I really didn't need it, as much as I liked it ... then when I decided I liked it enough to buy it anyway, it was gone. On Sunday morning, it was back :) I snapped it up. That's how I like to shop, it makes me feel my purchases are justified and meant to be in the grand scheme of things. It's the same way I bought my Ceremonial Indian Elephant Stairs and my Hippo Table. Anyway, I spent the rest of the day relaxing at home with Loulou, updating my iPod and lazing in the sun with my book and Honey while she gardened. Of course we cooled down with the occasional dip in the complex pool, had to break in the new bikini I bought on Saturday. Finally I found one. Just in time for Moz! Varen & I spent Sunday evening at the movies again, this time wasting a few hours on The Fountain. What if you could live forever? 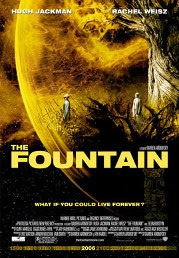 The Fountain is an odyssey about one man's eternal struggle to save the woman he loves. His epic journey begins in 16th-century Spain, where conquistador Tomas (Hugh Jackman) commences his search for the Fountain of Youth, the legendary entity believed to grant immortality. As modern-day scientist Tommy Creo, he desperately struggles to find a cure for the cancer that is killing his beloved wife, Isabel (Rachel Weisz). Traveling through deep space as a 26th-century astronaut, Tom begins to grasp the mysteries that have consumed him for a millennium. The three stories converge into one truth, as the Thomas of all periods – warrior, scientist, and explorer – comes to terms with life, love, death and rebirth. What a load of shite. Some cool concepts and some beautiful imagery and a fairly impressive cast. Unfortunately not a good movie. It left even me completely confused by the end as to why there were so many layers to such a simple story-line. Over kill and unnecessary, although without it, you hardly have a movie. I'd suggest giving this a skip, don't even rent the video. Anyway, now I must go ... I've had a truly hectic Monday, spent doing very menial tasks to build a clean Regression Test Pack of messages - oh the exciting life I lead! And I'm being rushed off to drinks to meet the crowd we're holidaying with in Mozambique next month. Yay.